Travel on Orange Avenue going north. Take a right on Gore Street. Turn left at the first light onto Delaney Avenue. 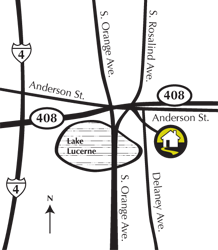 The Appleton House will be on your right hand side about 1/2 mile up across from Lake Lucerne. Take your right hand exit onto the 408 traveling East. Once you enter the ramp stay in your right lane to immediately exit the Orange Avenue exit. At the bottom of the ramp stay to the left and go through the stop sign almost directly into our driveway at 539 Delaney Avenue. Take the Anderson Street exit and make a left onto Anderson Street. Stay on Anderson and get in the right lane, take the first right after you go under the 408 overpass onto Delaney Avenue. Go past first light and turn left into our driveway at 539 Delaney Avenue. Travel on the 408 and exit onto the Orange Avenue exit downtown. Take the Rosalind exit and stay in left lane. Take a left onto Magnolia Avenue. Take another immediate left onto Anderson Street and get in the right lane. Get in the right lane, take the first right after you go under the 408 overpass onto Delaney Avenue.